What follows is a detailed guide to all 23 players in Venezuela’s 2015 Copa América squad, their manager Noel Sanvicente and how he is likely to set up his team. This is intended both as a reference guide if any of the players catch the eye of viewers during the tournament and also as a complementary article to the main team preview. As the other piece provides context for much of what follows below, including details on how the team’s warm-up games have gone over the past year, it is recommended that readers first have a browse of that before delving into this one. Possible line-up for Venezuela’s opening Copa América game against Colombia on Sunday 14 June 2015 (Reported on 8 June 2015; Image courtesy of @MisterVinotinto). Please note: this starting XI is not confirmed and is based on media reports of how the side has been lining up in training in the week or so before the start of the tournament. While it may not be entirely accurate in terms of personnel and/or positioning, it does nevertheless serve as a useful way to help structure the information below. Although many individuals are capable of playing in more than one role, the profiles have largely been organised according to where the players appear to be most likely to play. Hispanospherical.com has enormous, possibly misplaced, faith in the abilities of its readers to engage their brains when confronted with information that comes to conflict with how reality pans out. 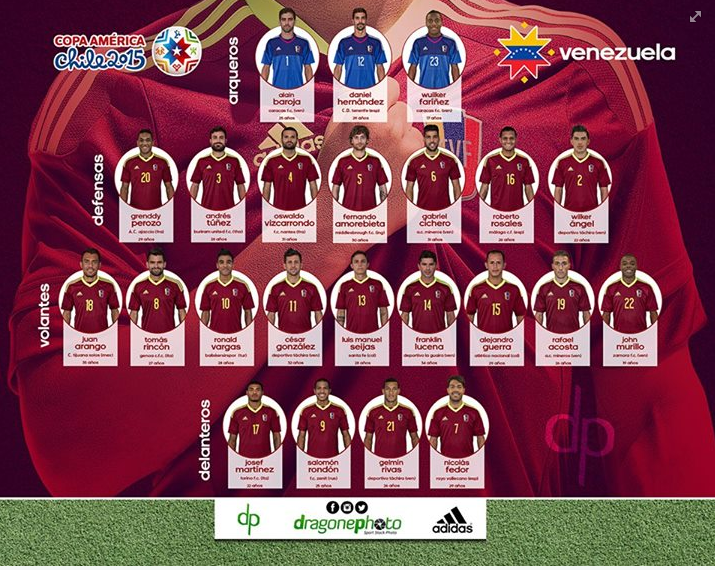 Another possible line-up for Venezuela’s opening Copa América game against Colombia on Sunday 14 June 2015 (Reported on 13 June 2015; Image courtesy of @MisterVinotinto). Update (13 June 2015): According to the slightly altered line-up above, which is based on new reports from the training ground on the eve of the opening game, there may be two personnel changes to the XI initially observed. These are noted in updates in the sections on the three positions affected: Goalkeepers, Deep-Lying Playmakers and Left-sided Attacking Midfielders. Further updates will appear here as the line-ups for each game are announced. Update (14 June 2015): This is the official line-up vs Colombia, albeit with Guerra and Arango switching positions. As noted, the team preview article contains details on the side’s preparations coming into this tournament and, consequently, what their likely aims will be. While it is highly recommended readers at least have a browse at how La Vinotinto have fared in warm-up games since new boss Noel Sanvicente took over in July 2014, a brief listing of their results nevertheless follows below (click on the links if you wish to read match reports and/or watch video highlights). A former Venezuelan international in his playing days and a seven-time championship winner in his homeland as a manager, 50-year-old Noel ‘Chita’ Sanvicente was a popular choice upon his appointment in July 2014. His achievements were – and still are – very much fresh in the minds of all domestic football followers, having at the time just been crowned champion with Zamora – the second time in consecutive years and the only two title wins in the history of this modest club from Barinas. Before this, while he had a short spell with Real Esppor (now Deportivo La Guaira), it was his eight-year association with Caracas FC (2002-10) where he made his name on the touchline. Here, he not only won the league five times but also enjoyed some impressive scalps in the Copa Libertadores, most notably two group stage wins against River Plate in 2007 and then negotiating his side’s progress to the Quarter-Finals of 2009’s competition. Consequently, not only is he a proven winner and accustomed to relatively high-pressure situations, but he has also long been personally familiar with approximately half of the players in the current squad, having managed them at club level. Thus, though the first eleven months of his reign have been somewhat lacklustre, there is plenty of belief amongst the players, fans and the FVF (Federación Venezolana de Fútbol) that eventually, things will fall into place. He has been working towards altering the collective mindset and approach of the team, attempting to transplant his predecessor César Farías’ rather successful counter-attacking set-up with more forward-orientated, high-pressing tactics. Unfortunately, on his watch, not only has the team shipped an abundance of goals but the attacking players have often looked like strangers, struggling to combine effectively and failing to replicate their club form for their country. Unless by some mysterious alchemy Sanvicente has managed to integrate everyone into his desired system in the past few weeks – despite not playing a single official warm-up game in the lead-up and, due to club commitments, rarely having his full squad to work with – it is difficult to see how Venezuela will make much of an impression this month. Indeed, drawn in Group C with Colombia, Peru and Brazil, it seems the result of the second match against Los Incas, as well as the points tallies of the third-placed teams in the other two groups, will determine their chances of progressing. Sanvicente has recently commented that he sees his job more to qualify for the World Cup rather than to win Copa América – no doubt true, but possibly also an admission that his team is not entirely ready just yet to emulate the history-making achievements of the past decade. While at times in a few games of Sanvicente’s reign a transient 4-4-2 has seemingly formed, with Mario Rondón typically linking up with his namesake Salomón, as the former has surprisingly been excluded from the final squad, a more standard 4-2-3-1 is likely to be consistently employed. Given the flexibility of this formation and the calibre of opponents, it can be expected that this arrangement may look more like a 4-5-1 when, as may frequently be the case, Venezuela are on the back foot. Nevertheless, the only real question about this system is whether, instead of two defence-minded players in front of the back four, a partnership combining a roaming battle-hardened tough-tackler with a more graceful deep-lying playmaker may be preferred. The former has generally been the norm in friendlies over the past year but in the days leading up to the tournament, it has been reported that the latter has been regularly experimented with in training. Dani Hernández (29 years old), the joint-second tallest player in this competition (1.97m), inspires much respect for his career trajectory, having worked his way up from the third and fourth tiers in Spain, before managing to experience a season in the top-flight with Real Valladolid back in 2012-13. As 2014-15 began in the Segunda, he soon found himself playing second fiddle to the new arrival Javi Varas and so made a January switch to Tenerife where, though he only narrowly avoided relegation, he achieved impressive statistics for a goalkeeper mired in such a plight (19 goals conceded in 20 games). Internationally, he has been the first choice for his country over the past year, having played all but one of the internationals under Sanvicente that have been open to overseas players. However, given that he has just 20 caps to his name and has a propensity to spread uncertainty with not only his positioning but also his often erratic scrambling for crosses and his frequent tendency to parry shots straight back into the danger zone, a long-term occupation between the sticks can not be guaranteed. Indeed, while in the lead-up to the tournament Hernández has maintained his position in training, Chita appears to be keeping fans second-guessing his intentions as he has allocated rival Alain Baroja the number one shirt. The Caracas goalkeeper has had a sublime domestic season, making a string of sensational, acrobatic saves which, given his team-mates’ goal-shy displays, were crucial to his side coming hauntingly close to winning the Torneo Clausura in May. Internationally, while it may be a mere coincidence and the standard of opposition has to be taken into account, all three wins of the Sanvicente era have come with the Caraqueño in goal. At just 25 years of age, a move abroad seems almost a matter-of-course and, despite only making his international debut back in February, establishing himself as his country’s number one in the foreseeable future is very much within his grasp – time will tell if this occurs this month. Update (13 June 2015): Sanvicente is indeed maintaining the intrigue until the very last moment before the Colombia game, as in a slightly altered line-up tried in training and reported on the eve of the match, it is Baroja and not Hernández who is allegedly starting. Big tournament for the Caracas man if so. Lastly, Baroja’s club team-mate Wuilker Fariñez is undoubtedly third in line as well as the biggest – if, most likely, inconsequential in the short-term – surprise in the squad. 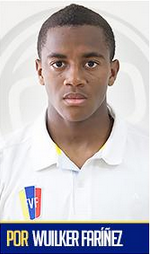 At just 17 years of age and with little more than a Copa Venezuela appearance as well as four displays in March’s Sudamericano Sub-17 tournament on his CV, he is the youngest player in the whole tournament. In overlooking several more established shot-stoppers, Sanvicente is evidently not anticipating simultaneous spells on the sidelines for Hernández and Baroja. Instead, he has stated that he views Fariñez’s inclusion as a long-term investment with the experience gained hopefully standing him in good stead for future international engagements. Having started his professional career in Uruguay with Montevideo Wanderers back in 2003, Gabriel Cichero (31) has managed to intersperse three spells in his homeland with stints of varying success in Italy, Bulgaria, USA, Argentina, France and Switzerland, never staying anywhere for more than two years. In the past year at international level, he has played seven of Sanvicente’s eight games at left-back, only missing the Peru game in March due to injury. Now officially registered with Swiss side Sion but on loan at Mineros de Guayana in the season just gone, Cichero was a frequent target of scorn from fans following the first four friendly matches of the nera era. Though he was not alone in this respect, age appeared to be catching up with this 2011 regular, with the 5-0 thumping meted out by Chile, during which he struggled to keep pace with the opposition’s dynamic wing-play, the definite nadir. However, since the turn of the year, while his club continued to underperform, from an attacking perspective at least, he has shown a marked improvement, scoring four goals in the league as well as a golazo for the national side against Jamaica. While not likely to take on an opposition winger down the flank, he likes to come forward, often taking a strike from range and/or making his presence felt at set-pieces. Nevertheless, if the way La Vinotinto have lined up in training recently is anything to go by, Cichero may surprisingly lose his starting place to the man who stood in for him against Peru, Fernando Amorebieta (30). The Fulham defender began the last campaign at club level out of favour in west London and ended it sitting on the bench at Wembley on loan at Middlesbrough in the Teessiders’ ultimately unsuccessful Championship play-off final match. In between, he did little to restore his declining reputation back to his Athletic Bilbao heyday, rarely being at full fitness in an injury-hit season and, most pertinently, looking woefully out of position when he did appear – usually on the left. Indeed, not a man blessed with pace, he looked clumsy and had great difficulties keeping track with jinking wingers craftily cutting inside. Not entirely dissimilar to Cichero, he had a little more joy going forward, putting in crosses from the wing and being a threat from set-pieces. However, his favoured position is at centre-back so if he does get the nod on the flank, it would not be a surprise to see him later moved across or, if Colombia’s Juan Cuadrado gives him a particularly tortuous time in the opening game, unceremoniously excluded altogether. Although Nantes stalwart Oswaldo Vizcarrondo (31) can be assured of a starting place, having played in all six Sanvicente-era games as well as performing regularly and consistently at the highest club level of anyone in this position, his partner is less clear. There are four other options in this department and, given the noted issues at the back, it could very well transpire that Vizca ends the tournament having played alongside more than one of them. Thus, the leadership, organisational and renowned communication skills of this imposing, committed individual will be vital to the entire team’s chances. Regarding Vizcarrondo’s most likely fellow-starter, Fernando Amorebieta had seemed like the leading candidate, having resumed his old 2011-13 partnership with Vizcarrondo against Jamaica in late March following an international absence of 17 months. However, if the latest training ground reports are anything to go by, it would appear that Sanvicente is more swayed by the defensive line-up that played four days later against Peru that secured his first clean sheet, favouring Amorebieta on the left and Andrés Túñez (28) instead in the centre. This has been the only international appearance in the present era for the Buriram United man who, having left his boyhood club Celta Vigo in 2014, won the championship in his first season in Thailand, becoming a masked cult hero along the way. While he is another who would not stand a chance in the 100m sprint, he is nevertheless a mobile, aerial presence who often emits a calm demeanour. Perhaps crucially in his bid to get the nod, having played well recently in the AFC Champions League, he possesses current fitness levels that Amorebieta has rarely displayed this year at club level. If, however, neither of these men start, Sanvicente has two further options. In contrast to all of the players discussed so far, the first of the additional back-ups is the somewhat diminutive and comparatively pacy Grenddy Perozo (29), who was Vizcarrondo’s partner throughout the 2011 tournament. However, though he was named in the early – and defensively woeful – line-ups chosen by Sanvicente, his international career appears to have regressed somewhat. Indeed, he was not called up to the March squad and coupled with his underwhelming form at club level – Ajaccio, relegated in 2013-14 to France’s Ligue 2 only narrowly avoided a consecutive relegation in 2014-15 by a mere point – a return to favour does not appear to be on the horizon any time soon. A man seemingly with a brighter future than Perozo and perhaps more likely to stand in if a bit of youth is required, is Deportivo Táchira’s Wilker Ángel (22). It is unclear whether, over a month on, the smile has been wiped from his face following his final-day header in the fourth minute of stoppage-time that breathtakingly snatched away the Clausura title from Caracas, devastating Vinotinto colleague Baroja in the process. He has within the past year been linked with a move abroad and made his international debut back in November, scoring a header with the faintest of touches against Bolivia, in what is still his only national team appearance. Having not been called up for any subsequent squads until the present one, it is tempting to think that his Clausura-winning goal, with all the elation and hyperbole that greeted it, aided his selection. Nevertheless, though he will have a battle on his hands to get any playing time, he is one of only a very small number of players in this group who have a realistic chance of leaving their homeland for pastures new after the tournament’s conclusion. That is not a criticism of the quality of this squad; on the contrary, a mere glance at where all the players are currently based instead makes apparent just how far the nation has come in the past decade or so. Since making the step up last year from FC Twente, he has proved to be more than capable of maintaining his close-tracking and tenacious tackling approach in his top-half Spanish side. Though the nature of his club’s style and the forwards at their disposal may be why his regular, pacy forays up the flank have only yielded three assists (which, nevertheless, put him third overall for the season just gone), in open play at least, he certainly provides more than his international defensive colleagues do in this department. Playing in a role few schoolboys tend to daydream about emulating, defensive midfielder Tomás Rincón (27) is nevertheless the most important player in this squad. 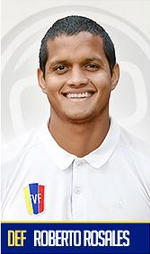 Although some other previews on Venezuela have picked out striker Salomón Rondón or ageing icon Juan Arango as their key man, El General will surely be playing the lead role in determining La Vinotinto‘s fortunes. Indeed, as if to confirm this status, in the run-up to the tournament, he was officially allocated the captain’s armband, taking over from the long-serving Arango. Following over five years with Hamburg, he has enjoyed a largely successful debut season in Serie A, finishing sixth with unfashionable Genoa and has been linked with a big move to La Liga or a return to the Bundesliga. Valencia is the strongest rumour of the several currently doing the rounds and though a repeat of 2011, when he was named the Adidas Player of the Tournament, seems a big ask, an impressive showing will certainly do him no harm. 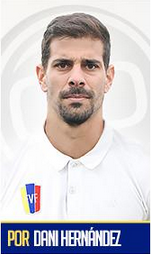 Rincón’s defensive midfield partner four years ago was Franklin Lucena (34) and if Sanvicente ultimately errs on the side of caution, particularly for the Colombia and Brazil games, the experienced Deportivo La Guaira man would be in a shoo-in to reprise this role. However, as is the case for a few of Venezuela’s most impressive performers from 2011, age is not really on the side of El Paky (a nickname one suspects British broadcasters of the tournament will not be using). Indeed, Lucena’s advancing years were presumably a concern of the coach as he did not appear in the first matchday squad back in September. While he featured in the two November losses, it was not until February’s line-ups of home-based players for the games against Honduras that it could be said that he made a claim for a starting place. Here, he captained the side, flicked in a goal and was generally a vital pillar of assurance while playing in his customary no-frills holding role. He then continued in this position for the following month’s clash with Jamaica, though he was withdrawn at half-time as Sanvicente experimented with a more attack-minded player next to Rincón, as he also did in the subsequent game with Peru from the off. Ultimately, whether Lucena starts or comes on to shore things up, one expects to see him on the pitch at some stage in the upcoming weeks. This, however, can not be said with any confidence about the other player in the squad whose attributes are closest to those of the two aforementioned men: Mineros de Guayana’s Rafael Acosta (26). Indeed, it was Acosta who Lucena replaced during the latter’s first outing under Sanvicente in the 5-0 loss to Chile, as the former’s almost ghost-like presence in the middle of the park repeatedly allowed the opposition to stride through. While Acosta started the following game against Bolivia alongside Lucena, he was no more than a second-half substitute in the two domestic XI clashes with Honduras and was then omitted completely from the March friendlies. Given this fall from grace and an underwhelming club season, the inclusion of this relatively internationally inexperienced individual certainly was not news to everyone’s ears. While he perhaps offers something slightly different, being more inclined than the other two to get forward, of all the outfield players, he is the one with seemingly the least chance of making it onto the field. A role which may or may not be utilised, it was nevertheless experimented with in March’s two friendlies as well as, more pertinently, in training sessions leading up to the tournament. Juan Arango, now 35 and understandably slowing down, is the most likely candidate if this position is ultimately given the green light. Indeed, though the free-kick maestro and scorer of almost exclusively sensational goals made his name in Spain and Germany with more of an attacking licence – centrally as well as on the left – he became accustomed to this role at club level in the season that has just passed. Having returned last year to Mexico where he played before he made the transition to Europe back in 2004, while his current club Xolos de Tijuana had an underwhelming campaign, he gradually came to flourish in this less energy-sapping placement, particularly in the league’s second half (the Torneo Clausura). Overall in Liga MX, he scored nine goals and officially received credit for six assists, though his inviting crosses, corners and free-kicks certainly played a prominent role in at least a few more. Playing in his sixth Copa América, though he may not be the same player who spearheaded the history-making 2007 Quarter-Final finish and who was later named in most observers’ 2011 Best XI of the Tournament pieces, his pin-point long-range passes could still be vital this time around. Although a place in the line-up can not be entirely guaranteed, he has played in all four games that he has been available for under Sanvicente (starting three and making a strong impression when he came on against Peru). If he starts but in another position, reprising a more forward role behind the striker or on the left are certainly possibilities. Update (13 June 2015): On the eve of the opening game, it has been reported that in a slightly altered team that has been practising in training which has two personnel changes to the one previously observed, Arango has been playing as the left-sided attacker, with Luis Manuel Seijas instead as the deep-lying playmaker. If Arango does start off the tournament on the left (or, according to some alternative interpretations, in the middle), there is nevertheless a strong chance that he may drift back to beside Rincón at some point. It will be of possibly painful intrigue to see if his legs are still up to a more forward position. If Sanvicente does opt for this role, but situates Arango elsewhere, two candidates in with a strong shout are a certain pair who have recently been playing in the Copa Libertadores with Colombian sides. Firstly, Luis Manuel Seijas, more accustomed to playing on the left of attack both internationally and for Independiente Santa Fe, found himself in this position from the start against Peru in March. While it can not have been said to have been an unqualified success, its usage in a victory against a group stage rival may well have influenced the manager’s thinking. Update (13 June 2015): As noted above, Seijas may well start in this position. If, however, the ex-Standard Liège man is overlooked, Alejandro Guerra, who has been on loan to Atlético Nacional from Mineros de Guayana for the past year, could find himself here, though it seems more likely in his case that a more advanced position is in the offing. Similarly, while there is a slight chance that Deportivo Táchira’s César González could do a job here from the bench, his natural place is further forward on the flank. More on these three individuals below. The three attacking positions behind the striker are easily the most competitive in the squad. The likes of Sanvicente-regular Mario Rondón (who perhaps did himself few favours moving from Portugal to China in February), Christian Santos (23 league goals in NEC Nijmegen’s phenomenal promotion to the Eredivisie) and Yohandry Orozco (four years ago, arguably the country’s brightest prospect) failed to make the final 23, having been cut from the 30-man preliminary squad. Furthermore, Rio Ave’s Yonathan Del Valle, who last season scored some fine goals in the Europa League as well as a dramatic late domestic winner against Benfica, has barely even been considered, a situation that has led to him ‘resigning’ from the national team at the age of 25. Given the contemporary tendency of fielding inverted wingers, with an individual who is predominantly right-footed ending up cutting inside from the left (and vice versa), as well as the versatility of those who have made it into the final squad – not to mention the inconsistency of Sanvicente’s selections – these positions are somewhat difficult to predict. Consequently, the bulk of information pertaining to certain players may be located underneath a position they ultimately do not play in. As noted earlier in the Deep-Lying Playmakers section, Independiente Santa Fe’s Luis Manuel Seijas (29 on 23 June) is more at home in this position and has played here twice (against Japan and Bolivia) in his four appearances in the past year. Though far from Usain Bolt, he nevertheless possesses some pace as well as being capable of swinging in testing crosses and is certainly not afraid to shoot from range. If he is on the pitch and Arango – another player who could certainly perform in this role – is not, expect him to take charge of set-pieces. An experienced international with over 50 caps, whether or not he starts either here or a little further back, expect to see this 2014 Torneo Finalización champion at some point. Update (13 June 2015): As noted elsewhere, according to reports on the eve of the opening game, there is a strong chance that against Colombia Seijas will play as the deep-lying playmaker with Arango instead starting in this position on the left. If, as is being suggested by reports, neither Seijas nor Arango is fielded in this left-sided spot to begin with, there are several other contenders in the frame. According to how the team has been training, Torino’s Josef Martínez (22) appears to be the likeliest candidate to start, despite being more regularly deployed at club level just behind the striker. Indeed, he can also play as the front man and if there are any problems with Salomón Rondón up top, he could well be pushed forward to step in. Update (13 June 2015): According to a new line-up tried in training with two changes to the one at the top of the page, he may not start after all. While there are some suggestions that he may still start in an attacking position, see the sections on Seijas and/or Arango for more details. Other contenders in this area include the aforementioned Murillo and González as well as the returning Ronald Vargas but more on these three predominantly right-footed players in the Right-sided Attacking Midfielders section further down. Given his role at Torino and the excitement which his potential elicits, Martínez would be many fans’ favourite to start in this position, though according to reports, Alejandro Guerra (29) may well get the nod here – at least for the Colombia game. Indeed, though a spot on the flank could certainly also be suited to the latter, as Martínez has more ability to take on his man, whereas Guerra tends to worm his way into key central positions, take shots from around the edge of the area and be rather direct in his approach, this reported arrangement could well work out. In a slightly different formation, both men linked up well after coming off the bench against Jamaica back in March and one would expect to see the pair get at least one start each in the tournament, possibly far more. Update (13 June 2015): While Guerra keeps his proposed place in a slightly altered line-up reported on the eve of the opening game, Martínez does not feature in this new possible XI. See the section on Arango, his possible replacement, for more information. Possessing similar international experience to Seijas, Guerra has played some part in all four of the games in the past year that he has been available for, starting all but the Jamaica game. At club level over the past year, while not always initially named on the pitch with Atlético Nacional in the league, playing roughly half of their games, he did manage to score five goals. More prominently, he did play over half of the first leg of December’s Copa Sudamericana final against River Plate and, more recently, featured in six Copa Libertadores matches, memorably coming off the bench against Barcelona (de Guayaquil) to score this acrobatic effort. As it appears that he will be returning to his parent club, Mineros de Guayana, this competition offers him an opportunity to continue playing his football at a higher level than Venezuela can offer – something that, when he finally made the move abroad at 28 to Nacional last year, he said he had long craved. Otherwise, if neither of these two players end up here or if an alternative is sought, then Arango could well reprise his glory days at some point. Murillo and, especially Vargas, are also possibilities, but more on these two below. Both Martínez and Guerra are certainly in with a shout for this position as well but, in perhaps the most curious inclusion in the alleged opening-day line-up, Ronald Vargas (28) may well start off the competition here. Curious because in all of Sanvicente’s time in charge, the only matchday squads he has been part of were the two in March, where he played just half an hour against Jamaica and less than 15 minutes in the Peru win. However, Vargas has had what must cautiously be considered a rejuvenation or sorts, having played regularly in the past year for Turkish side Balıkesirspor, scoring six league goals and setting up several more. That, barring an early scare, he went through the season without any major injuries is ample cause for many Venezuelans to celebrate. Indeed, when he first moved to Europe in 2008, he was considered by many as the country’s brightest prospect and, on occasion, he has gone some way to demonstrating why – most notably in the 2010-11 league campaign for Club Brugge when he scored 15 goals in 23 games. This earned him a move to Anderlecht, yet three injury-plagued seasons and 25 league appearances (nine starts) later, it was to end on a limp note, as he was released on a free. Last August, not long after he had been given a chance to rehabilitate himself in Turkey an article was published in the Venezuelan media stating that in all he has missed well over a year of his career to injury in his then-six-and-a-half year European career. It is a sorry fact that in all this time, he has never played more than 26 league games in any one season. Concurrently, his international career stalled, with his early exploits – such as his goal in his nation’s first ever win against Brazil in a 2008 friendly – a distant memory and he has picked up less than 20 caps overall. Nevertheless, following his year in Turkey as well as two goals in Venezuela’s late-May practice game against Godoy Cruz youths, he appears to have done enough to earn Sanvicente’s trust and favour, especially as he has been handed the much sought-after number 10 shirt – a position some feel is his strongest. Given that he has also recently agreed a move to the more prestigious AEK Athens, one can only imagine the high spirits he must currently be in after having endured so many setbacks. Though he is not likely to start in the opening game, Jhon Murillo, who must be on cloud nine having recently turned 20 and signed for Benfica from Zamora, stands a fair chance of entering the fray at some point – if only as an impact substitute. Presumably due to this potentially life-changing move as well as there being no other young attacking player in the squad who has not already played for a European club, he has been singled out in many preview features as Venezuela’s hot prospect to watch. Maybe. He has, after all, reportedly impressed Arango in training, knows Sanvicente well from when the coach was at Zamora (2012-14) and, given the chance, will delight in aggressively running at defenders and pouncing on any hesitancy. However, with so much competition in this area and the fact that he has only previously been called up for one game – the second against Honduras in February in which, due to a defensive mix-up, he capitalised to score 37 seconds into his debut – one wonders if it is all a bit too much, too soon. Indeed, he has done remarkably well in his early club career, making his Zamora debut under Chita at the end of the 2012-13 campaign, before scoring an impressive 19 goals in 54 league games (all starts) in the subsequent two seasons while playing on the wing as well as, at times, more centrally. He was also his now ex-club’s leading threat this year in their otherwise dismal Libertadores campaign, scoring twice in four games. One last player who regularly plays in this position at club level and also did at the last Copa América is Deportivo Táchira’s César González. The 32-year-old is not lacking in experience though with so many pacy rivals on this flank, one wonders where this more reserved, calculating player will fit in. As noted, a holding position further back is not entirely out of the question, though not anticipated. His inclusion in the final squad, while not a shock, did raise a few eyebrows simply because, in contrast to some of the players who were ultimately discarded, he has barely played during the Sanvicente era. Indeed, though he knows the coach well from his spell at Caracas between 2005-07, his only call-up for the international side in the past year came in March, when he ended up starting against Peru. It should be said, it is likely that he would have featured in the previous month’s friendlies against Honduras but, like his Táchira team-mates, was unable to join his home-based colleagues due to playing in the ultimately successful Libertadores qualifying play-offs against Paraguay’s Cerro Porteño. Subsequently, he was a regular in the Libertadores group stage and while his side had a fairly forgettable campaign, he did manage to bag three goals in these six matches. On a related note, while he is more of a playmaker, typically playing through balls to be finished off and swinging in free-kicks to be headed home, he did manage a very impressive goalscoring return last season, netting 13 goals in 31 games. No doubt this form – one of his best campaigns in a career that has included stints at four Argentine clubs – in Táchira’s dramatic championship-winning season contributed heavily to him winning a spot in the squad. Although he may not get on the pitch, his tournament experience should come in handy. 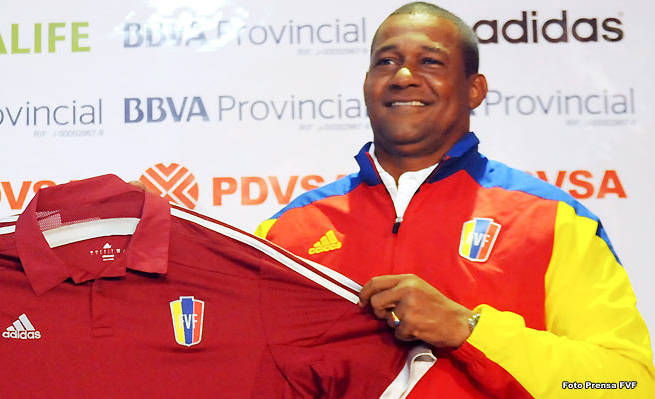 Salomón Rondón (25), the most expensive Venezuelan of all time, is considered by many as the team’s main man. Understandable, given that in the season just gone he played in both major European club competitions and ended it as champion and joint-second top-scorer of the Russian Premier League. However, internationally, his success is largely dependent on the service provided by those behind him – something that has been frustratingly lacking in the past year, as he has not managed to score in any of his four outings, often appearing anonymous. When he has received chances, he has at times lacked composure and direction. Furthermore, though he may have only been 21 four years ago at Copa América 2011, he did come into the tournament with a domestic scoring rate of one in two in his debut season at Málaga and subsequently featured in all six of his country’s games (three starts), scoring just the once. While he does have an important role to play and will be looking to use his height to spring onto the end of balls coming into the area as well as be on his toes finish off chances, it can be easy to overstate his significance to this team. The tournament could potentially be a great opportunity for Rondón to put himself in the shop window, as the talk emanating out of Zenit St Petersburg for the past several months has been that manager André Villas-Boas is seeking to offload him. Further fuelling the rumours, the player has commented more than once that he fancies trying his luck in England or Germany, though would not be averse to a return to Spain either. Media reports have dutifully obliged, with stories published linking him to, among others, Tottenham, Liverpool, Wolfsburg and Sevilla. While he may struggle to shine in such a tough group when Venezuela may often be on the back foot, the presence of such a relatively high calibre marksman up top ensures that those behind know, that if they can just play the right ball forward, the team will always have a chance. As mentioned, if Rondón is sidelined for whatever reason, there is a strong chance that Martínez will be pushed forward. However, in such a scenario, if Sanvicente elects to keep the Torino livewire behind the lead man, then the likelihood would be that Nicolás ‘Miku’ Fedor (29) will instead step in. The inclusion of the Rayo Vallecano forward has not gone down entirely well with some, seemingly due to his lack of game-time this season, combined with the perception that the best years of his career have already been and passed. Sanvicente, on the other hand, appears to have more faith in the man of Hungarian extraction (‘Miku’ is short for ‘Miklós’). Indeed, while he did not call him up for any friendlies this year, Miku did feature in the first four games of his reign, albeit only once as a starter. It is likely that a change of clubs around two-thirds into the season has aided his return to the fold. He started off the 2014-15 campaign at Qatari side Al-Gharafa, who he had joined at the end of September 2013 from Getafe where, having worked his way up the Spanish pyramid, he enjoyed his most prosperous professional period. However, in Qatar, he was to find his first-team opportunities gradually diminishing and became a regular fixture on the bench, scoring only one goal there last season. When Vallecano came in for him, he jumped at the chance to return to the country that he started off his career in as a teenager, though he had to wait until early April to make his debut. Ultimately, he was to make seven appearances (two as a starter) for the overachieving club from Vallecas, scoring twice – one effectively a tap-in, the other a clinical strike on the turn. Thus, having proved he still has something to offer at a high level, if he is called upon in this tournament, the striker who played in all six of the games in 2011 should not feel overwhelmed by the occasion. Lastly, there is Gelmin Rivas (26) who, somewhat remarkably, is the only outfield player in the entire squad to have not been called up for a single matchday grouping in the Sanvicente era. It should be noted though, that given his domestic form with eventual champions Táchira (20 goals in 31 games, the second-highest in the league), he most likely would have been called up to the February squad had he not been otherwise engaged. Indeed, while his home-based compatriots were twice defeating Honduras, he was spearheading his club’s entry into the Copa Libertadores group stage, scoring two crucial goals in the decisive leg of the play-off with Cerro Porteño. All the same, no call-up was forthcoming in March, though he did make May’s 30-man preliminary squad and evidently Sanvicente liked what he saw. In terms of attributes, perhaps at a level or two below, he shares much in common with the other two main strikers, getting the majority of his goals from close-range finishes and headers. Having had a couple of Belgian sides allegedly sniffing around him at the turn of the year, he will definitely be wanting to put himself in the shop window. However, given the competition for this solitary position, he will have quite the task on his hands to see any minutes in this year’s tournament. This entry was posted in Venezuela National Team and tagged Alain Baroja, Alejandro Guerra, Andres Túñez, Brazil, César González, Chile 2015, Colombia, Copa América, Copa América 2015, Copa América Group C, Dani Hernández, English Copa América coverage, Fernando Amorebieta, Franklin Lucena, Gabriel Cichero, Gelmin Rivas, Grenddy Perozo, Jhon Murillo, Josef Martínez, Juan Arango, La Vinotinto, Luis Manuel Seijas, Miku, Oswaldo Vizcarrondo, Peru, Rafael Acosta, Roberto Rosales, Ronald Vargas, Salomón Rondón, Tomas Rincón, Venezuela, Venezuelan Football, Wilker Ángel, Wuilker Fariñez on June 12, 2015 by hispanospherical.